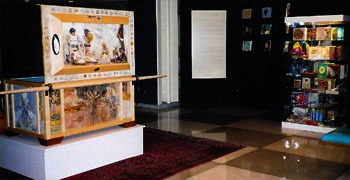 The Ark of Hope, a 49"(124.5cm) x 32" (81.3cm) x 32" (81.3cm) wooden chest was created as a place of refuge for the Earth Charter document, an international peoples treaty for building a just, sustainable, and peaceful global society in the 21st century. Visit - www.earthcharter.org - for complete information on the Earth Charter. The Ark of Hope also provides refuge for the Temenos Books, Images and Words for Global Healing, Peace, and Gratitude. Over 1,000 handcrafted 8" x 8" x 2" books have been made by artists, schoolchildren, and citizens around the world, expressing their individual and collaborative prayers and affirmations for Earth. The Earth Charter's 16 principles are the guiding vision behind the creation of these books. 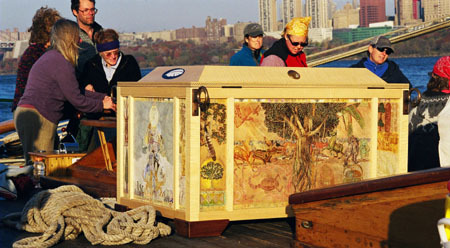 The Ark was designed and painted by Vermont, USA artist Sally Linder, built by cabitnetmaker Kevin Jenness and lined by fabric artist Beth Haggart. It was crafted from a single plank of sycamore maple from a sustainable forest in Germany. The five painted panels that form the sides and top of the Ark each represent the flora and fauna of the world as seen through the images of the world's traditional artists. Each panel visualizes a season, a direction, an element, and a universal symbol. Symbols of faith from traditional religions and indigenous societies surround the top panel of "Spirit" that honors the children and young animals of the world. The 96" carrying poles are unicorn horns which render evil ineffective. Inside the Ark's lid is the Earth Charter handwritten on papyrus paper. The University of Cairo supplied Sally with instructions for making paper with papyrus - a plant known to have the ability to purify water of pollutants. The papyrus was harvested from the Living Systems, Inc. waste treatment plant in South Burlington, VT, soaked for two weeks in Sally's bathtub, then pressed using 90,000 pounds of pressure at Langdell Papers, a Vermont papermaker in East Topsham. The Ark of Hope was created for a celebration of the Earth Charter held at Shelburne Farms, Vermont on September 9, 2001. The event, for love of Earth, featured keynote speaker Jane Goodall, global peace walker Satish Kumar, musician Paul Winter, and Dr. Steven C. Rockefeller, a member of the Earth Charter Commission. On September 11, 2001 volunteers were cleaning up from the September 9th event when news of the New York and Washington, DC terrorist attacks and tragedies was heard. Sally Linder's immediate, spontaneous response to the horror was to begin walking the Ark of Hope to New York and the United Nations. Joined by Andrea Morgante and Janet Fredericks, they carried the 200-pound chest across the meadows of the farm to Rt. 7 where they were joined by Susan Diehl Dufort. Hundreds of walkers joined the pilgrimage to New York City, bringing with them hope and the vision of the Earth Charter to communities along the way. For two months the Ark of Hope was walked over 350 miles through four states. The last leg of the journey down the Hudson River was aboard Pete Seeger's legendary sloop The Clearwater. Due to heightened security at the United Nations the Ark of Hope rested at New York's Interfaith Center upon arrival. Recognizing that the United Nations is central to global efforts to solve problems which challenge humanity, the Ark of Hope carrying the Earth Charter and the Temenos Books was exhibited at the United Nations during the World Summit PrepComII in January-February 2002. At the 2002 World Summit on Sustainable Development in Johannesburg, South Africa, the Ark of Hope was ceremoniously offered to the world by the children of Diepsloot, an informal settlement in Johannesburg. Visit our NEWS and EVENTS section for stories and photographs of the walk to New York City and the journey to South Africa. Bangalore, India was the next port of call for the Temenos Books. 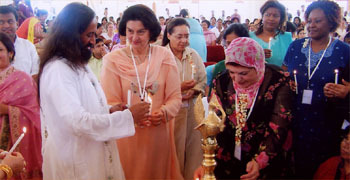 At the 2005 International Women's Conference hosted by His Holiness Sri Sri Ravi Shankar , Sally Linder shared Temenos Books and introduced thousands of women from around the world to the Earth Charter. Traveling on to Amsterdam in the Netherlands for the Earth Charter +5 conference the Ark of Hope and Temenos Books were exhibited at the Tropenmuseum in September - December 2005. Visit www.earthcharter.org for details of this important conference. By invitation of the Ark of Hope, Her Royal Highness Queen Beatrix of the Netherlands created a Temenos Book. Over 8,000 Dutch children were introduced to the Charter through the Tropenmuseum Junior, the international children's magazine samsam and the magazine Kidsweek. Thousands of Temenos pages were made by the children. Twenty-five winning pages were ceremoniously accepted by Queen Beatrix and placed in her Temenos Book which was gifted to the Ark of Hope at the Earth Charter +5 event. The remaining Temenos pages were bound into dozens of Temenos Books created by Tropenmuseum staff and volunteers. These books will travel with the other hundreds of books in the Ark of Hope. Visit our NEWS and EVENTS section for newspaper articles and photographs of Queen Beatrix with the Ark of Hope. The Ark of Hope carrying the vision of the Earth Charter belongs to Earth and humankind. Its life grows when it is shared. It is hoped that nations around the world will bring the Ark to their people, continuing to introduce the Earth Charter to audiences globally, spreading hope and the recognition of the interdependence of justice, and economic and ecological integrity that together build a culture of peace. Organizations, schools and universities, faith communities, museums, and international conferences have hosted the Ark of Hope since its creation in 2001. To invite the Ark to your community, institution or conference visit this website's CONTACT US section. To create Temenos Books or pages to add to the Ark visit the TEMENOS BOOKS section.